*Disclosure: I received free park tickets in exchange for this post. The opinions expressed here, however, are my own. 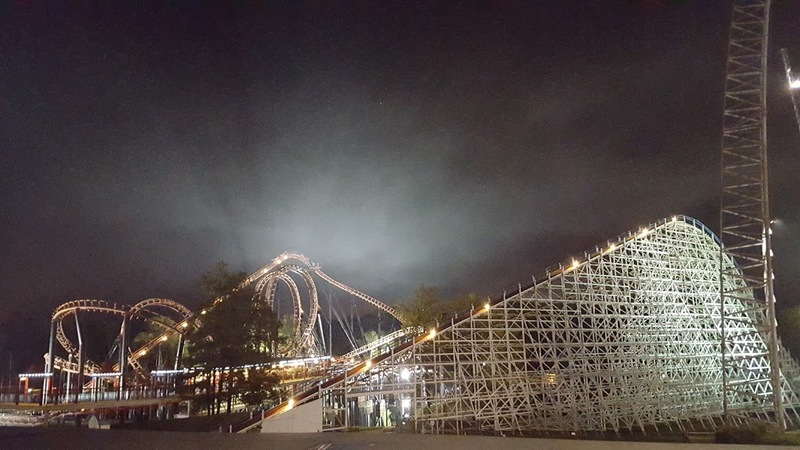 This past weekend, I was in Atlanta visiting a good high school friend of mine, who happens to have season tickets for Six Flags Over Georgia (Austell, GA). I had gone to the park with her last year, but only briefly, since I was primarily in Atlanta for Walker Stalker Con. This year, our schedule was open, and we decided to spend two days at the park! 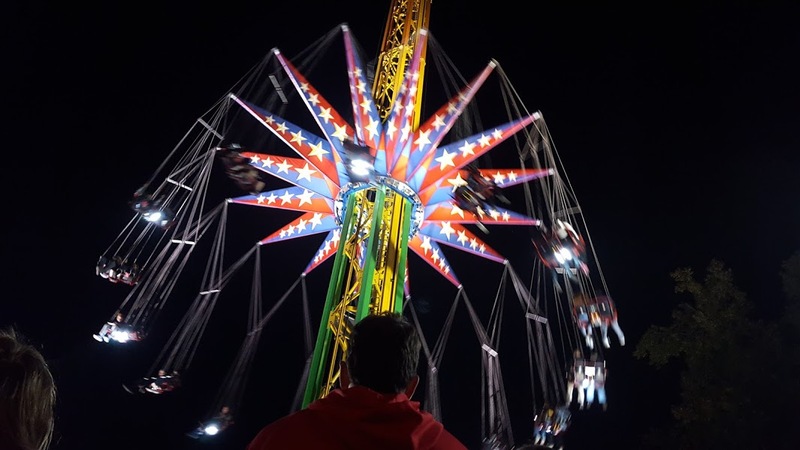 On Friday, because of Fright Fest, the park opened at 6pm. After braving the insane Atlanta traffic, we finally arrived, and met up with a few of her friends there. The nice part about going two days in a row is that we knew that any ride we couldn't get to on Friday night, we could ride on Saturday instead. 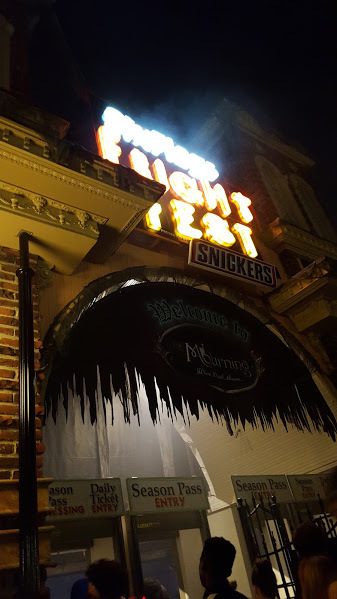 Fright Fest is only after dark, too, so we wanted to get our scares on (ha) that night too since we weren't staying Saturday night. 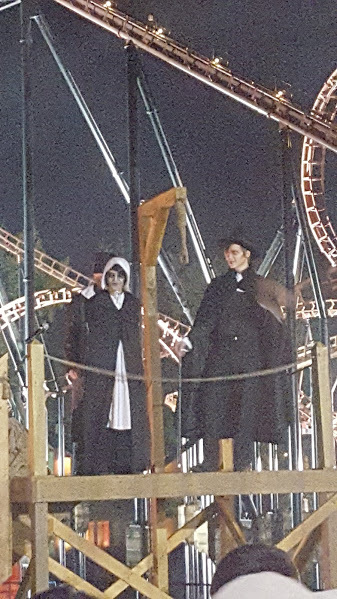 The entire park was essentially a "Fright Fest" - you could see live performances, like this Salem Witch Trial one above, and also go into small mazes - but if you wanted to do specific Fright Fest rides/certain scares, it was an additional fee, even for season pass holders, so we skipped that. There were still plenty of ghouls and goblins roaming about though, and it definitely reminded me of Halloweekends at Cedar Point. On Friday night, we went on a few coasters, including the Great American Scream Machine (known simply as "Scream Machine," to those familiar with the park), which is a wooden coaster, and the swings (see above). It was actually pretty cold once the swings started to ascend! 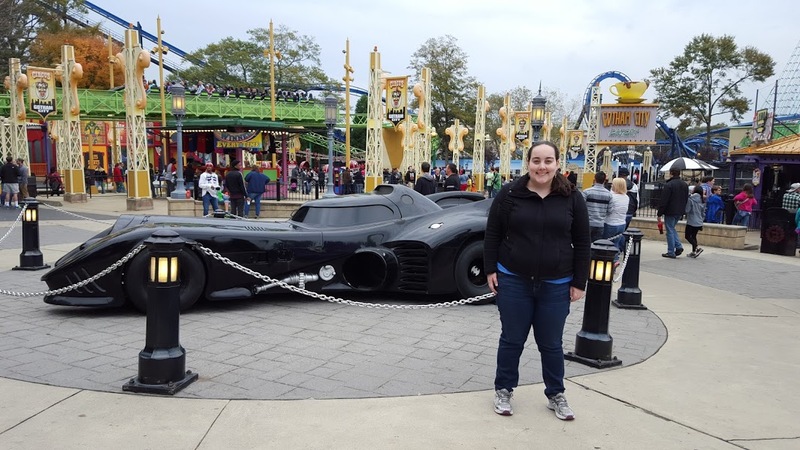 The park is separated into sections, one of them being Gotham City, which, as a movie blogger, I found to be very cool. All of the rides are Gotham/Batman-themed, too, including the Batman roller coaster (which was fun, but I found it to be similar to the Raptor, at Cedar Point, with the Raptor being better), the Mindbender coaster (which was great! ), and some Joker-themed rides too. The Goliath! 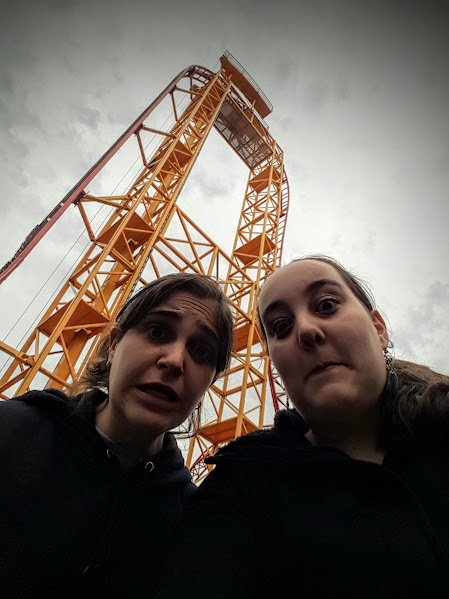 My friend had said that initially the Goliath had scared her, but eventually she conquered her fear and rode it. 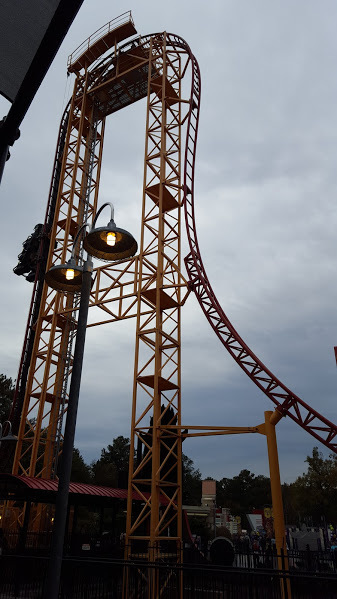 The first drop is 200 feet - and Top Thrill Dragster at CP is 400 feet, so that should have felt like nothing to me - but the angle, or something, was very intense, and I felt like I was going to fly out of my seat. We were ambitious and made this our first ride on Saturday, and it was definitely a great choice! Other rides of note: Daredevil Flight School, which I had rode last year but wanted to go on again; the Superman coaster, though unfortunately we didn't have time this year to ride it; and the swings, which were fun although maybe not worth the hour+ wait. The park is open until January 3, 2016, but only on weekends (Fridays through Sundays) until then. "Fright Fest" was the park's theme when I went, and now it is "Holiday in the Park". Tickets at the gate are $63.99 ($43.99 for children under 48" tall, and FREE for kids ages two and younger), but you can save $20+ by buying tickets online. I searched for discount codes before my trip (originally, I did not have media tickets) and RetailMeNot had a few good ones. Parking will cost you $20, unless you're a season pass holder, in which case it's free. If you live in the area, I highly recommend buying a season pass: they start at $50-55, and are good for the entire year. They also include free parking. My friend who lives in Atlanta said she has gone at least ten times this year, which would have been $200 just in parking fees. Plan on doing a lot of walking: the park is large, and to get from the parking area to the park gate is a bit of trek too, although they do have a tram that you can take if you like. Have you ever been to Six Flags Over Georgia, or perhaps another Six Flags amusement park? 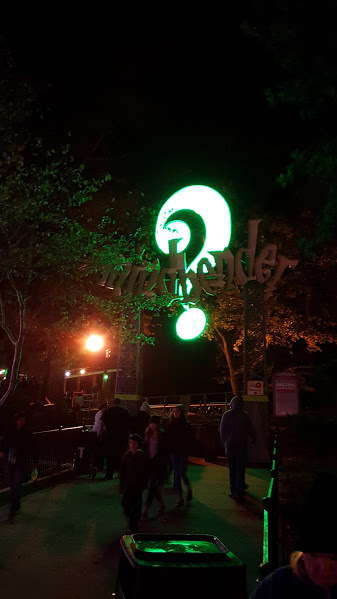 How was your experience and what were some of your favorite rides?